Young Gifted and Black: Weed is Legal!! 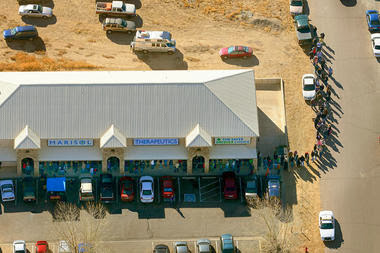 In Colorado that is...Long Lines Ensue..High Grade will Cost a Pretty Penny! Weed is Legal!! In Colorado that is...Long Lines Ensue..High Grade will Cost a Pretty Penny! Accompanied by a swell of media coverage and law enforcement officials, sales began at 8 a.m. Wednesday, and "government officials marveled at the calm," according to a report in the Denver Post. ‘‘Everything’s gone pretty smoothly,’’ Barbara Brohl, head of Colorado’s Marijuana Enforcement Division, told the Associated Press. Thirty-seven licensed retailers opened for sales, most of them in Denver, according to the Post. Denver police issued two citations for public marijuana consumption during the day, but the department could not confirm that these were related to the day's sales. Smoking pot in public remains illegal in Colorado, but the New York Times reports that some of the day's customers got around that problem by buying edible products like pot-laced chocolate truffles and baked goods. Perhaps the only blip in the new industry's roll-out were inflated prices that customers worried could make the drug less affordable for medical users. Colorado has not established a statewide pricing structure, the AP reports, and midafternoon Wednesday at least one dispensary was charging $70 for one-eighth of an ounce of high-quality marijuana. The day before, medical marijuana patients paid as little as $25 for the same amount. ‘‘We hope that the focus on recreational doesn’t take the focus away from patients who really need this medicine,’’ Laura Kriho of the patient advocacy group Cannabis Therapy Institute told AP. Any Colorado resident who is at least 21 can now buy up to an ounce or marijuana legally, and out-of-state visitors can buy up to a quarter ounce, which they must consume in Colorado. To help keep the crop from migrating to states where it remains illegal, the Denver airport has posted signs warning travelers that they cannot take pot with them when they leave.